Health experts supports a low-fat, plant-based diet for optimal health. Keeping in line the United States Department of Agriculture (USDA) recently released â€œMy plate,â€ that gives a graphic representation of the mealtime configuration of food. 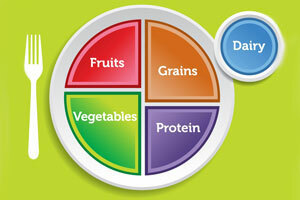 What we get see is a circular plate divided into four sections representing four food groups: vegetables (green sector), grains (orange), fruits (red), protein (purple). The dairy group is represented by a small blue circle next to the plate; intended to illustrate a glass of fat-free or low-fat milk, or cup of yogurt. Vegetables represent the largest sector on the plate. Together, fruits and vegetables represent half the plate; grains and â€œproteinâ€ each represent less than one quarter of the plate. What makes the protein group unique is that protein is a nutrient, but has always been grouped as a food. The plate as a guide is a huge shift. The plate encourages whole grains over refined grains, but does not discourage carbohydrate intake. â€¢ Enjoy your food, but eat less. â€¢ Make half your plate fruits and vegetables. â€¢ Make at least half your grains whole grains. â€¢ Switch to fat-free or low-fat (1%) milk. â€¢ Compare sodium in foods like soup, bread, and frozen meals ? and choose the foods with lower numbers. â€¢ Drink water instead of sugary drinks. The plate icon advises all to limit high-fat products like meat and cheese. The protein portion of the USDA’s MyPlate is unnecessary, because beans, whole grains, and vegetables are loaded with it. And MyPlate reserves a special place for dairy products, which are packed with fat and cholesterol and may increase the risk of health problems ranging from asthma to some types of cancer. There are many more healthful sources of calcium.